Salman Khan's bail plea was reserved for a day on Friday by judge Ravindra Kumar Joshi, who has now been transferred to Sirohi. Bollywood superstar Salman Khan was on Saturday granted bail by the Jodhpur sessions court. The actor is likely to be released by 7 pm tonight after the bail order is submitted to jail authorities. He will be released on two bail bonds of Rs 25,000 each. He was sentenced to five years in jail for killing two blackbucks, has spent two nights in the Jodhpur Central Jail. His bail plea was reserved for a day on Friday by judge Ravindra Kumar Joshi, who has been transferred to Sirohi. Salman Khan as reached Mumbai and is headed towards his home - Galaxy Appartments. Salman Khan has reached the Jodhpur aiport and will now head to Mumbai. Salman Khan leaves the premises of the Jodhpur Central Jail in a car with two bodyguards. It is not yet clear if the superstar will leave for Mumbai immediately or stay in his hotel for some time. His sisters Alvira and Arpita, who have been camping in Jodhpur, since Thursday, are expected to join the actor. Relatives of Jodhpur Central Jail prisoners said police aren't letting them meet their relatives inside the jail. 'It's for the first time I'm unable to meet my husband', said a woman who had come to meet her husband in jail. Salman Khan, who was lodged in same jail, would be released shortly. Salman Khan will travel from Jodhpur to Mumbai in a chartered plane. He is likely to leave the city before 6 pm today. Jodhpur Central Jail authorities have received Salman Khan's release order. The actor is expected to be released in the next few minutes after he completes the formalities. Salman's bodyguard Shera has reached the jail. A separate vehicle with two other bodyguards has also reached jail to receive Salman. Members of the Bishnoi Samaj, who had registered the complaint against Salman, have said that they will approach the High Court against the verdict. The Bishnois consider the blackbuck to be the reincarnation of their religious Guru Bhagwan Jambeshwar also known as Jambaji. Elated with the order, fans of Salman Khan have gathered outside his residence in Mumbai. The next date for the hearing is May 7, 2018. He has been granted bail but will have to seek permission from the court if he has to leave the country. His lawyers are claiming that the actor will be able to walk out if jail after 7 pm tonight. Salman has to produce a personal bond of Rs 50,000 plus two other bonds of Rs 25,000 each. 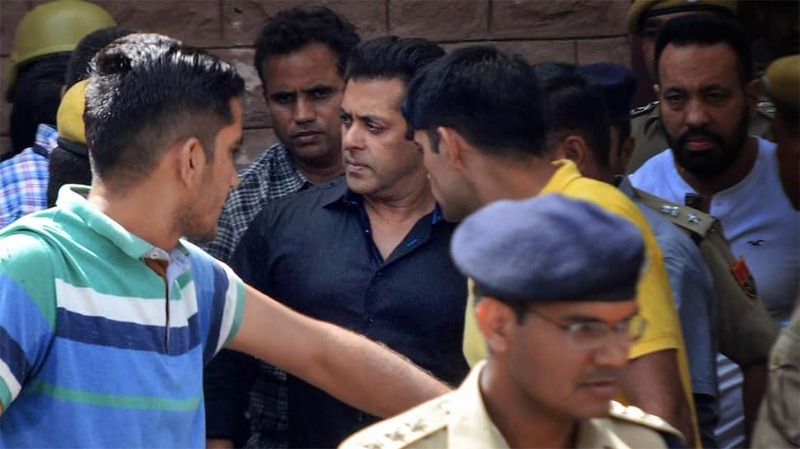 The two people who will sign the bail bonds for Salman are likely to be Rajkumar Sharma and Champalal. "There was no reason why he would not be allowed a bail," his lawyers said. Salman Khan has been granted bail by the Jodhpur Sessions Court. He is likely to step out of jail by the evening. As per latest information, Salman Khan's order is likely to be announced after 3 pm. His sisters Alvira and Arpita have reached the court premises. Even if the order goes in his favour, if his lawyers do not get the written copy of the order by 6 pm today, he will have to spend the weekend in jail. The Defence lawyers have argued that the witness is unreliable as she lives two kilometres away from where the blackbucks were killed. They are claiming that it is not possible for anyone to reach the spot 2 kms away just a moment after hearing the gunshots. Prosecutors asserted in court that salman should not be given the bail. They are arguing on the witness statement presenting it as a proof of why the actor should remain in jail. The issue was listed at the 15th number but has been advanced to the first, Salman's supporters are viewing this as a positive sign. Members of the Bishnoi samaj, who have fought for 20 years for Salman's conviction, are hoping that the actor remains in jail. "He should be punished for the crime that he has committed," a member of the community said outside the Jodhpur Sessions court where the actor's bail hearing is underway. The bail hearing for Salman Khan has begun. District & sessions court judge Ravindra Kumar Joshi is hearing the application. The district and sessions court had on Friday heard the arguments on the suspension of sentence and bail application but had reserved its decision on Bollywood superstar Salman Khan's bail plea for today. The court had called for the records of the case from the trial court. One of Salman Khan's bodyguard had an argument with the media outside court, where he got into a scuffle. He was escorted away from the spot by the police. Salman's sister Alvira, and his bodyguard Shera have been allowed to go inside the court. Salman Khan was likely to speak to his mother from the jail. His mother had deposited the money for the STD call to speak to him in jail. However, it is not yet confirmed whether the call was made. Judge Dev Kumar Khatri who gave Salman the 5-year sentence is in talks with judge Ravindra Kumar, the judge who is hearing the bail plea in his chamber in the Jodhpur court.